All our Iyengar Yoga teachers are fully qualified with extensive teaching experience. We’re expanding our teaching network and inviting qualified and experienced Iyengar Yoga teachers to come and join us at the centre. We’d like to hear from those interested in leading a regular class, hosting a workshop or a one-off event. If you’re a Iyengar Yoga teacher interested in joining our thriving network, please do get in touch. I still remember my very first Iyengar Yoga class taught to university students by a lecturer who was also a yoga teacher and believed we needed the physical and mental benefits that yoga brings. From the first pose –Tadasana - I was hooked. Who would have guessed that standing on your two feet carefully aligning the body starting from the feet and working up you could feel grounded, uplifted and calm all at the same time? I have attended IYISL for many years and have benefitted hugely from the teaching which has been both strongly challenging and genuinely encouraging. I have also really enjoyed the feeling of a community. I am now an intermediate level teacher. It makes me very happy to be able to play my part on passing on the practice of yoga which has so much real wealth to offer to anyone who is prepared to get on a yoga mat and start trying to learn with an open mind. I aim to pass on an understanding of the Asana and how to improve our practice of them as clearly as I can. I started attending Iyengar Yoga classes at the IYISL in 1997 with Glenys Shepherd. I was ‘infected’ very quickly with the yoga bug and became passionate about this discipline and by 2002 had my Introductory Teacher Certificate. I felt good, energised, balanced and healthier the more I practiced and felt a strong urge to share this with people. I love the therapeutic effects of the Asana and Pranayama. I have been an intermediate level teacher since 2012. My classes are challenging, inspiring and fun with an emphasis on precision, alignment and a wise use of equipment to help reach an effortless expression of the poses. I aim to teach with both firmness and compassion but also with a sense of humour! I have been an introductory level Iyengar Yoga teacher since 2007 and before that a long standing student at IYISL. I am drawn to the Iyengar Yoga approach, as the discipline and accuracy of the teaching promotes the true meaning of yoga - the yoke or union between mind and body. This means while the body benefits from physical exercise, you also exercise your mind through concentration and awareness. I like to keep my classes precise and fast paced and I enjoy the holistic approach to the practice and this is what I endeavour to bring to my classes. I imagined me in my first yoga class to be sitting cross legged serenely humming around a candle. By my second Asana (pose) I was shaking like a leaf in the wind and sweating - a lot! Not at all what I imagined yoga to be. When I laid down at the end of the class in Savasana (corpse pose) I found such peace, I left the class in total awe of what I had experienced. I continued to attend yoga classes, gradually opening my awareness as I opened my body. I have been practising yoga since 1996 and the journey yoga has taken me on has enlightened and enriched me and continues to enrich my life on so many levels. I started teaching yoga some years ago and I am now an intermediate level teacher. I like to make my classes energetic, balanced and fun. I teach in a wide range of places but my favourite place is certainly IYISL. It's a great space with a huge range of props which we can use to really work at our poses. Sophie is a highly experienced Iyengar yoga teacher and is qualified to senior level 3. She is a challenging teacher with a clear and direct teaching style and teaches intermediate level classes and intermediate level teacher training at IYISL. 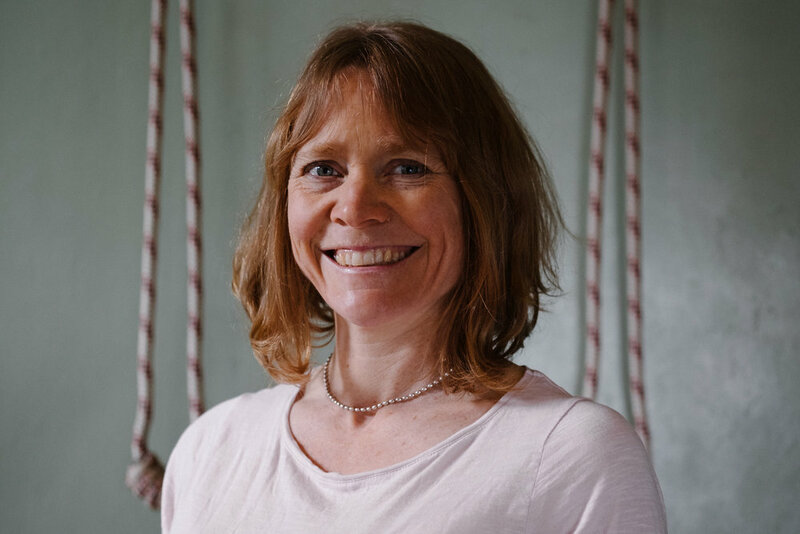 Sophie is a very dedicated Iyengar Yoga teacher who has been teaching Iyengar yoga for more than 15 years and is also a qualified teacher trainer and assessor. She is passionate about helping people develop their understanding and practice of yoga Asana and Pranayama. I was introduced to Iyengar yoga in 2000 and from the first inspiring class at the IYISL, I never looked back! Today I cannot imagine my life without the practice of yoga. The yoga journey is never ending and forever challenging, interesting and stimulating. I gained the UK Iyengar yoga teaching certificate in 2007 and have been teaching ever since. I now hold the Intermediate Junior 3 certificate...and my yoga studies continue. I have been lucky to come across very committed and generous teachers, from the UK and India, and I am sincerely grateful to have been able to learn from them. I like my students to experience the variety of poses and variations that the Iyengar yoga method can offer...no two classes are ever the same! The pace can be fast, or it can slow down to focus on fewer poses in more detail, but precision and care in execution are always key. B.K.S. Iyengar applied the teaching of the Yoga Sutras of Patanjali to asanas and pranayama practices as a tool towards self-development. All of us, students of Iyengar yoga, are truly blessed in having such a strong tradition behind us. When teaching, I endeavor to respect my teachers and stay true to the source. Roy has a BSc (Hon) Sports Science degree and has been a student of Iyengar yoga since 2001. His academic knowledge combined with over 10-years experience teaching Iyengar yoga has given him a practical outlook on the many physical and psychological benefits of Iyengar yoga. His approach is both thorough and energetic. Roy believes B. K. S. Iyengar’ s yoga method can help anyone to develop strength, endurance and flexibility combined with coordination, mental focus and relaxation needed to carry out daily living activities. He regularly travels to India to learn from the Iyengar family and has a keen interest in Indian philosophy especially the Yoga Sutras of Patanjali.